Radamel Falcao is Colombia’s all-time record goalscorer and is widely regarded as one of the greatest players ever to play for the national team. After cruelly missing out on the 2014 World Cup in Brazil, the striker played a pivotal role in the qualification for the 2018 tournament and will spearhead the attack at Russia 2018. Falcao, whose full name is Radamel Falcao Garcia Zarate, was born in Colombia’s northern coastal city of Santa Marta on February 10, 1986. At a young age it was clear that Falcao possessed a special talent for soccer and was thrust into the first team at Lanceros Boyaca when he was just 13 years old – the youngest player ever to debut in Colombian soccer history. Falcao went on to score just one goal for the Colombian second division side before making the move to Argentina, where he played his first professional game for Buenos Aires giants River Plate in 2005. It was here where Falcao’s career really took off. After starting out in the youth set-up Falcao soon broke into the first team and scored his first goals for the club in October 2005. Several injuries blighted much of his second year at the club before he won his first domestic trophy in 2008, clinching the Argentinian championship. Despite reports that it was a nickname given to him by his father in his youth, it was in fact one of his former River teammates who labelled him El Tigre as a joke relating to a TV commercial at the time. On the field Falcao’s form was such that his soaring reputation was drawing the attention of European soccer’s top clubs. Italian giants AC Milan and England’s Aston Villa were all rumored to be keen on the Colombian starlet, but it was Portuguese powerhouse Porto who won the race for his signature in January 2009, when he joined for a reported $7 million. The switch proved successful for both player and club as together they won the Portuguese League title, Europa League, Portuguese Super Cup (2) and Portuguese Cup (2) in a two-year period. A prolific scoring record of 41 goals in 51 games for Porto raised his profile even further and he even etched his name into the history books in 2011 by hitting 17 goals in the Europa League – the most ever scored by any player in a single European tournament. 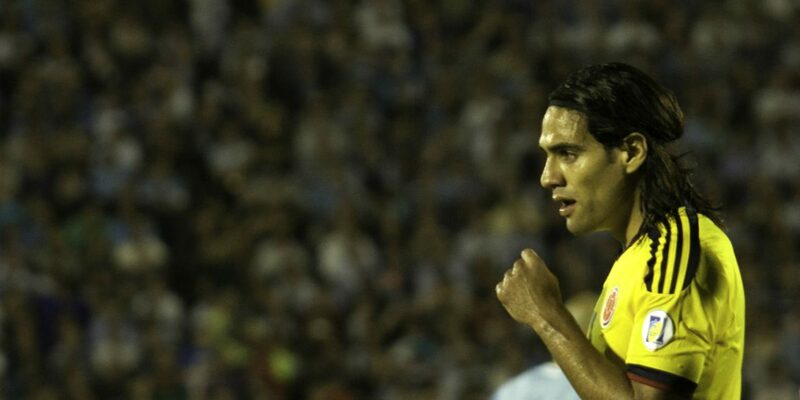 Despite all the success in league play, Falcao was struggling to reproduce his form on the international stage. A combination of injuries and bad form meant that he failed to help Colombia reach the 2010 World Cup in South Africa while they were also knocked out of the 2011 Copa America at the quarter final stage. Falcao was left partly to blame for Los Cafeteros’ exit from the tournament as he crucially missed a penalty against Peru, who scored twice in extra time to win 2-0. Nevertheless, the setback proved to be temporary as his eye-catching performances for Porto convinced Spanish side Atletico Madrid to splash just over $50 million for his signature. Falcao’s first goal for his new club came rather predictably in the Europa League on November 3 against Italian side Udinese. The love affair between Falcao and European soccer’s second most prestigious competition continued in the 2011/2012 season as he scored two in the final against Athletic Bilbao to become the first player to win the competition in consecutive years with two different clubs. In spite of injuries preventing the striker from joining the Colombian national team at the World Cup in Brazil, Falcao was snapped up by English top club Manchester United. However, as woes regarding his form continued, Manchester coach Louis van Gaal kept “El Tigre” on the bench for most 2015. Falcao moved to Chelsea for the 2015-16 season following an underwhelming year at Manchester United. Another year of injuries and poor form followed as the striker struggled to break into the starting line-up, making just 12 appearances for the Blues. The striker came in for major criticism with Britain’s Daily Telegraph newspaper highlighting that he had been paid $1 million per shot by Chelsea, a spell that the Colombian identified as the most difficult in his career. The Colombian’s move back to Monaco in 2016 was a turning point for him with the club establishing a young, dynamic squad with coach Leonardo Jardim’s advocating a free-flowing attacking approach, which yielded an average of three goals per game throughout the season. The renaissance of the striker saw him lead Monaco to the league title in 2016-17 as well as reaching the semi-finals of the UEFA Champions League for the first time since 2004. With the striker returning to his prolific best, he was nominated for the 2017 Ballon D’Or, which was eventually won by Cristiano Ronaldo. Falcao’s return to form at club level coincided with a resurgence at international level as he became the national team’s all-time top-goalscorer in June 2017, scoring his 26th goal in a 2-2 draw with Spain. His rejuvenation with Los Cafeteros saw them finish fourth in the CONMEBOL South American section of qualifying and secure an automatic place in the 2018 World Cup. Having reached the quarter-finals of the competition in 2014 without their talisman, Colombia will be hoping to go further in Russia with the prolific striker on board.